Crunchy, fluffy, flavorful hush puppies! Hey friends! 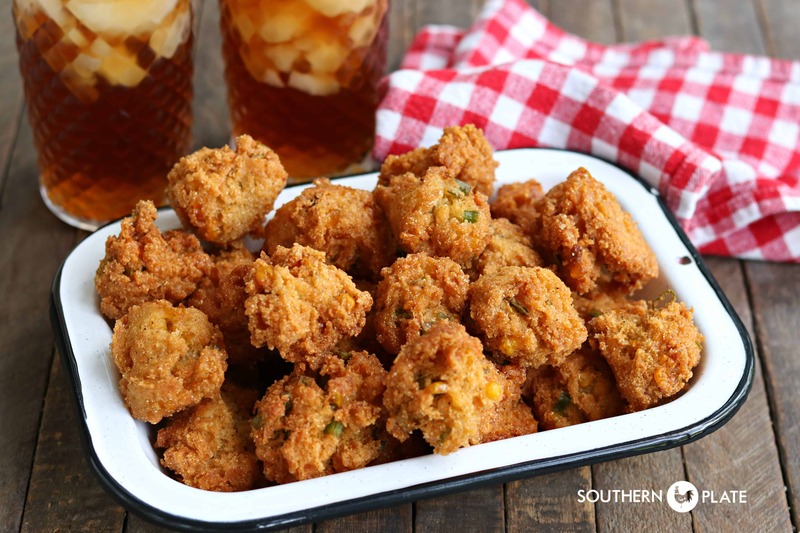 Today I’m bringing you a delicious Southern style hush puppy recipe, studded with sweet corn kernels, that can easily make a meal in and of itself. Okay, that isn’t the best course of action. I mean, of course you should add in some Dutch Oven Smokehouse Chicken and Miss Millie’s Best Coleslaw. But I don’t know of any Southerner who hasn’t been to a good bbq restaurant, had a basket of hush puppies put in front of them, and chowed down until they were about to bust at the seams – before their actual meal even made it to the table. These crunchy balls of cornbread deliciousness are made even more so with the addition of corn and chopped green onions. Better still, you don’t even need an egg or milk to make this recipe! 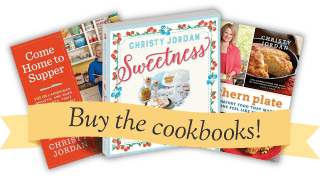 For those of you who want to get to cooking, hop on down to the printable recipe card and either print it or click the “save this” to save it to your online recipe box. For those of you who have a little time to visit, grab a glass of something nice and settle in. It was the day before Mother’s day but also a few hours before my daughter’s play at a local theater and so I found myself in the floral section of our local “fancy” grocery store. As I looked for the perfect bouquet, I heard a tiny voice to my right “Dis one! She’ll wuv dis!”. I looked up with a smile to see a precious little girl, around the age of three, holding her daddy’s hand as he pulled out the flowers his daughter had chosen. “Perfect. Okay now, what else should we get her? Can you think of something else Mama would like?” She beamed up at him with the biggest grin and wide eyes as she replied “YES! Mac and Cheese!”. I chuckled silently, as a mom, knowing full well that she had thought of her favorite thing and therefore wanted to gift it to her mother. My heart smiled as the daddy had the good sense to see this as well and immediately agreed to head to the Mac and cheese aisle for this “perfect” addition to her Mama’s gift. I imagine that Mama is about as tired of Mac and cheese as we all are by the time they reach that age – but at the same time I know she will see right through it to her daughter’s big loving heart and enjoy every blessed bite like never before. So often it’s like that with the people we love. We have a way that we feel loved and it differs from the way someone shows love and we end up with a wounded heart where no wound was intentionally inflicted. Maybe they don’t hug, hold hands, or say those three words. Maybe to them doing little things to care for a person is showing love – and carries more weight than words. Maybe they didn’t have a lot of physical affection as a child and it feels foreign to them. Many of us, each of us I’d venture, have gone through a lot of hurt and feeling unloved in our lives because we didn’t understand that people can’t always love us how we want to be loved, but they sometimes love us the best way they can. Maybe our favorite meal is filet mignon but they bring us mac and cheese because that is what they love and they want us to have the joy they feel. Place corn meal mix, flour, onion powder, and black pepper in a medium sized mixing bowl and stir to combine. Add entire can of corn, milk, and onions. Stir until well combined. In medium sauce pot, heat two inches of oil over medium high heat. When you drop a pinch of flour in the oil and it sizzles you'll know oil is ready. Carefully drop spoonfuls of hushpuppy batter into the oil and allow to cook, turning as needed, until fully browned on both sides. Remove to paper towel lined plate and repeat until all batter is used. Note: This post is not about abusive relationships but healthy relationships where two people simply have different ways of communicating their feelings. What a lovely story. Being privy to little vignettes like that make me so happy. I really want to make and eat all of those delicious hush puppies but being gluten sensitive I’m wondering if I can get away with not adding the 2 tablespoons of flour. What do you think? Yum… will try this weekend. One question: should the corn be drained? Thanks Christy. Hey Christy! The maternal side of my family came from Georgia. Sadly I never got my grandmother’s recipe for Hush Puppies that were to die for, but they didn’t look like yours and didn’t have corn or onions in them (though the onions sound good!). Do you have a recipe for simple Hush Puppies? I’ve been dying to fix them. Thank you so much, Julie D.
Ah, thanks for the timely reminder and the hush puppy recipe! Grew up loving them in the south and can rarely find anyplace that makes them out west. God bless! I don’t have any green onions. Do you think some chopped vadalias would be ok? If only more people understood this. Love this post, so true! The hush puppies sound delicious, what kind of corn meal mix do you use? I use Martha White when I can find it. It’s pretty common around here. My hubby and I just had an argument this last weekend over cans of creamed corn. He wanted to give them all away for a food drive. I wanted to keep them so I can make proper hush puppies. LOL! and that is the only thing I use it for, too! One of our favorite fish restaurants near my house serves a cheese dip for your hush puppies (I live in South Mississippi). It is great to dip your puppies in while you are waiting for your fish to be served. Do you happen to have a plain cheese dip recipe that would work for this purpose? (they keep theirs a secret but it is really just plain) If you haven’t tried some you need to. That would be a great addition Sonja!! This story with its lesson touched my heart. Wish I had known this is how some people love others many years ago. Would have spared me many hours of hurt. Thank you so much for sharing. 🙂 Yes, it can be a hurtful thing to learn at times. But, perhaps those hurts also teach us to appreciate that love a bit more when we figure it out. A very good lesson for all of us, no matter our age. Hope this story makes us all stop and think and consider the other person. Thanks for all you do, Christy! You are too kind Lisa, thank you! I love this at the end: The heart that loves in return learns to translate. That isn’t easy to learn for those of us with selfish tendencies. Meaning myself. I believe it’s worth learning, though. My hushpuppies are made with eggs and milk but your version looks so good! I’ll have to try it with the creamed corn. Hush puppy sounds great, thanks. Thank you Mary, I hope you get the chance to give them a try!! I will have to try these hush puppies. I love good hush puppies but haven’t seen too many recipes that sound good to me. I like to just barely cook done and lightly browned. I hope you like them Donna, can’t wait to hear back!! These look divine!! I can’t wait to try them. Thanks so much for sharing!! Thank you Tracie, I hope you get the chance to try them soon!! Due to their upbringing, some folks love the best way they know how. They may be able to break one cycle of abuse but not another. Too often we try and make it about us when it’s not about us at all. We need to give grace and take a bit of harshness out of both our lives. Wonderful hush puppies! I made this recipe tonight but I halved it. I’m not sure why but it took more milk than the recipe calls for just to get the meal to not be dry. Anyway, the hush puppies tasted wonderful and had a great texture! I was wondering if you could note how many servings and what the serving size is with your recipes. It helps more accurately determine how many calories to enter when entering the info in the app I use as I’m trying to lose weight. Thank you, Missy! Yeah, sometimes (often depending on the meal, weather, and how you hold your pinky toes) you will need to up the milk in things like hush puppies and cornbread. It helps to know what it’s supposed to look like so you can add the right amount and sounds like you did just that! I don’t include serving sizes since that is all relative. A 9×13 casserole at my house may feed six, but it may only feed four at someone else’s home. When you are entering recipes for calorie counts you can decide for yourself how much you’ll eat and thereby dictate your own serving size – and if you don’t like that calorie count you can always adjust the serving accordingly 🙂 By the way, Myfitnesspal.com is really handy and the site I use for things like this, just in case you haven’t happened upon it already – and it’s free. I loved this warming story. Its also wonderful when things you’ve learned are confirmed by other people who feel the same way and can put your same feelings into words. On another plane, do you have a recipe for home made cornbread mix? I live in Argentina and we don’t have anything like that over here. Thank you!! I live in the UK and am unable to buy self rising cornmeal mix. Can you please tell me how to make it myself. Thank you so much.